Don’t miss the chance to play one of the world’s best military golf courses, consistently voted Number One by DoD patrons. The Kaneohe Klipper is an 18-hole championship golf course with separate driving range, chipping and putting green. 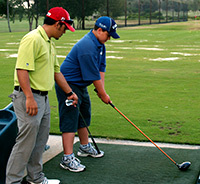 The course offers a variety of additional services including golf lessons, a Junior Golf Program and rental equipment. ADA compliant golf carts are also available. The next Commander’s Cup Golf Classic of 2019 will be held May 31. Check back for full details. E-5 and below may wear military uniforms on the driving range during lunch hours. Clubs and range balls are free to use. After 5 punches, the user can redeem the punch card for a free round of twilight golf as well as a $10 coupon for use at the Pro Shop or Sam Adams! The Afternoon Special is back by popular demand! Monday – Thursday* from 1300-1500 Receive as many holes of golf as you can get in before dark plus cart for one flat fee! After your round, receive one free pupu selection off Samuel Adams Burger & Brewhouse special menu, as well as one Coors Light draft or soft drink. Customers must present their golf receipt at the counter. *This special is not valid on holidays. Effective immediately, we are offering twilight rates to all golfers playing on Weekends and Holidays, starting at 1200!! 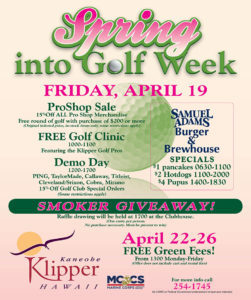 Take advantage of this amazing deal only at the Klipper Golf Course!!! K-Bay Spouse’s Club – NEW! Have you ever considered having a golf event for your unit at the Klipper Golf Course? Give us a call in the Pro Shop to inquire about how we can help you organize your next golf event. Call 808-254-1745. 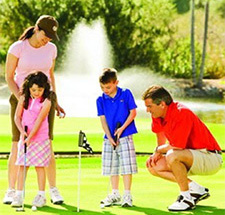 Bring your family for an evening of golf at the Klipper Golf Course. Click here to see a PDF of complete details. For guests who are non-DoD ID card holders, Marine Corps Base Hawaii has implemented a new policy to gain access to come aboard. For guests participating in our Public Partners Program (PPP), either current participants or those wishing to participate, please see this Public Partners Program PDF for instructions on how to complete the DBIDS application and apply for PPP. For additional information see this PDF for Visitor Credential Transition Instructions. 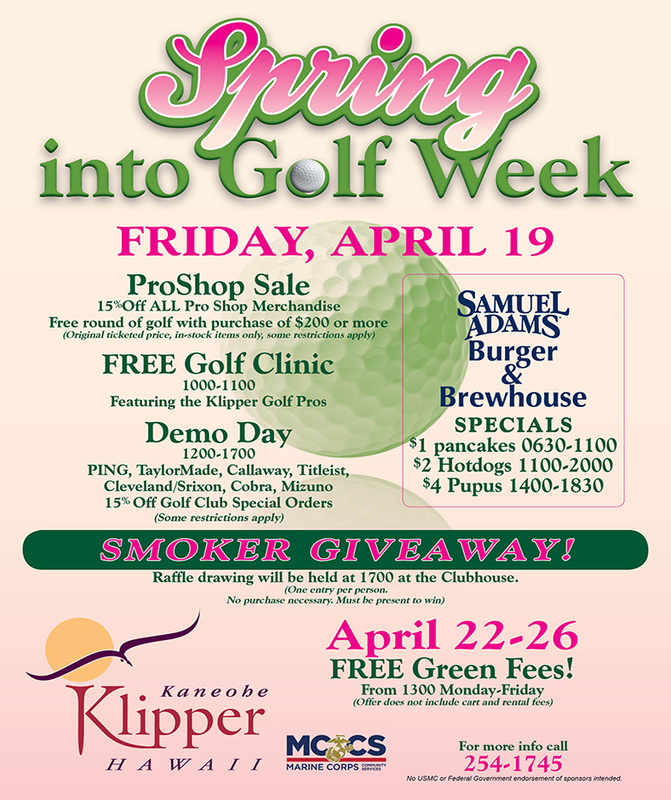 The Kaneohe Klipper offers numerous golf clinics for all levels of skill. 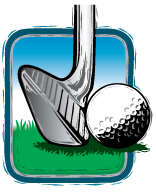 Junior Golf Program: Held on Wednesdays 5-6pm and Saturdays 10-11am. The cost is $200 for a 5-week session, 2 times per week. Call 808-375-9887 to register. Ladies Only Beginning Golf Program: Saturdays at 0830. One-hour sessions over five consecutive Saturdays. No equipment needed. Learn the basic skills and the ability to quickly improve enough to play a round of golf. The cost is $120. Call 808-386-3500 for more details. Ladies Intermediate/Advanced Golf Program: The session will focus on short game accuracy from 50 yards and closer. Additional emphasis on increased distance off the tee. Minimum of four golfers per session. The cost is $125.00. Call 808-386-3500 for more details. For information about Leland Lindsay clinics, click here. Learn all aspects of golf from a professional! Lessons provided by Leland Lindsay at Kaneohe Klipper Golf Course. Clinics are available for all skill levels. Lessons run for five weeks, one hour per week from 1630-1730. The cost is $99. To register, or for more information, please call Leland Lindsay at (808) 383-5697. The Klipper Junior Golf Program is a year-round program to bring children and teens to the game of golf. Focusing on basic playing skills, rules and golf etiquette, our program is one of the finest developmental programs in the state of Hawaii. Coaching is provided by certified PGA Professionals and the golfers get individualized attention, which adds to the quickest and most efficient improvement. When: Each session is five weeks long. Classes are held on Wednesdays and Saturdays from 4:00 – 5:00 pm for the younger beginning golfers and 5:00 – 6:00 pm for the more experienced golfers. Cost: $200 for the initial session (includes PGA logo golf shirt) and $150 for every session thereafter. Also includes free golf for the junior golfer on Tuesday afternoons after 4:00 pm. What to bring: Juniors can bring their own clubs or the staff can provide them. Collared shirts are mandatory. Tennis shoes and or golf shoes are acceptable dress. For detailed information call Mo Radke at (808) 386-3500. Another benefit brought to you by MCCS.